A journey of discovery through Italy's vineyards starts here. Navigating couldn't be easier. 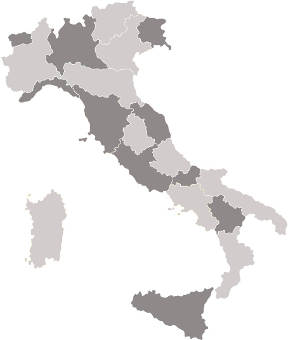 Just click on the Italian regions that interest you and the tour begins. As you travel through the vineyards of Italy, you'll discover wines you probably never imagined existed. Italy has a history of wine-making that dates back nearly 3,000 years. In fact, grapevines have been cultivated in Italy since the second millennium BC, when Italians came into contact with people from Crete. However, it was not until the emergence of civilisation in Rome that wine-making became a real art. The Romans allocated the role of protector of the vines to their god, Bacchus, who was honoured in riotous Bacchanalian festivals which eventually had to be suppressed by a decree in 186 BC. The grapes used to be trodden in "calcatorium" or crushed in "turcularium", and the stum poured into "dolia", large terracotta vases where fermentation took place. One of the earliest attempts to classify wine is found in the ancient Roman "Naturalis Historia" where Plinius the Elder distinguishes between about eighty high quality wines, destined to be consumed by nobility, and a hundred or so medium and low quality wines, destined to be consumed by the plebeians. At Roman banquets strict rituals governed how the drink was poured out. A little water was added to the wine, sometimes sea water, and it was flavoured with honey and spices by a so-called "arbiter", a figure that corresponds to the modern sommelier. At this time Italy was widely known as "Enotria", the land of wine, and it was the Romans, with the expansion of their empire, who introduced the cultivation of the grapevine to France, a country where in more recent times wine has become a focus of national pride. With the fall of the Roman Empire the dark ages began, dark for both humanity and for the art of wine-making. During the mediaeval period, which brought famine, pestilence and destruction, it was largely the church, with its need for wine for the communion, that prevented grapevines from returning to their wild state. With the passing of a new millennium and the advent of the Italian City States commerce returned, and wine occupied an important position among the goods exchanged. Between 1500 and 1700 certain wines became famous: Albana in Romagna, the wines of Montalcino and San Gimignano in Tuscany, Aleatico in Lazio, Ellenico in Campania and Mamertino in Sicily, some of which are still widely known today. In 1716 the first decree to define the rules for the production of a wine was issued by Cosimo III de' Medici for Chianti in Tuscany. Industrial wine production did not begin until the end of the nineteenth century. John Woodhouse, an Englishman, was one of the first to make use of modern wine-making techniques with the production of Marsala in Sicily. Unfortunately, this was also the period when phylloxera, a grapevine disease originating from America, drastically hit wine-making in Italy and abroad. In a few years this disease completely destroyed native Italian grapevines, which had to be reintroduced from American stock. Following the replanting of the vines, wine-making in Italy concentrated on quantity rather than quality. It was only after the Second World War with the advent of the laws of "Denominazione di Origine Controllata" (D.O.C. and D.O.C.G.) that wine-making in Italy flourished again, concentrating on the production of quality wines that are now valued by wine enthusiasts and experts throughout the world. It was during this period that smaller wine-making companies emerged, showing an astonishing level of dedication to cultivation, traditional wine-making techniques and, above all, quality. Today the Italian wine-making industry is made up of hundreds of small companies that produce wines of absolute excellence, but whose fame rarely travels beyond the borders of their region. Wineshop.it aims to bring the reality of the Italian wine industry to the world's attention, and to give these "craftsmen of wine" the chance to have their work recognised by an increasingly large general public.